Home Minister Asaduzzaman Khan on Friday said the country needs sacrificing people like blood donors to fulfill the dream of building Sonar Bangla, reports UNB. 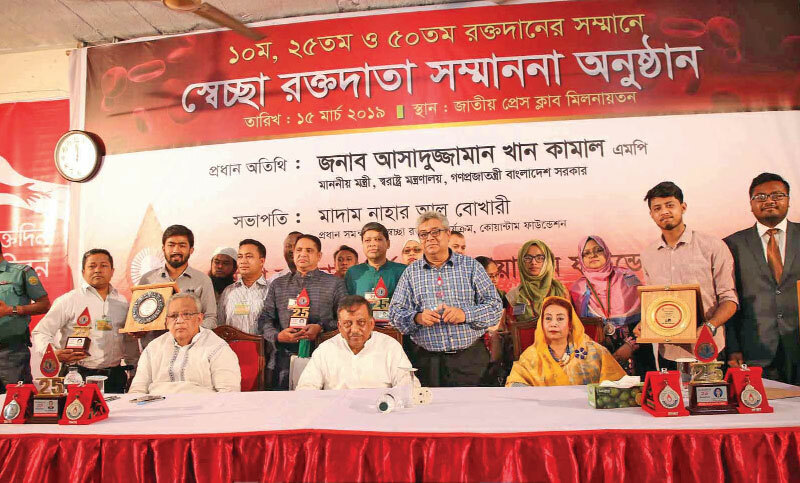 “These people (voluntary blood donors) are donating bloods to save lives without expecting anything,” he said while addressing a felicitation programme for the blood donors as the chief guest at Jatiya Press Club. Quantum Foundation (QF) organised the reception for donating blood at least 10, 25 and 50 times to save lives of the people. Around 173 donors received certificates, identification cards, crests and medals in recognition to their contribution to humanity. Professor M Nizamuddin Ahmed, Chairman of Palliative Medicine Department of Bangabandhu Sheikh Mujib Medical University (BSMMU) delivered the welcome address with Chief Coordinator Quantum Blood programme Madam Nahar Al Bokhari in the chair. On the occasion, Tareq Kuddus spoke on behalf of blood donors and thalassemia patient Sanjida Sumaiya Akter Sumi on behalf of recipients, said a press release. The Home Minister lauded the foundation for its noble role in meeting the country’s demand for blood and said the QF is playing strong role among the organisations engaged in voluntary blood donation. He said QF was able to supply more than 1.0 million units of blood during the last 18 years. Last year’s collection was 100,000 units, he added. The minister urged the blood donors to continue donating bloods till the permitted age for saving lives of ailing people. The Home Minister also mentioned about the services of QF including schools for underprivileged children and said hundreds of people have been benefitted from its meditation course in overcoming stress and anxiety. He said meditation is now worldwide recognised way to treat psychosomatic diseases. Dr Nizamuddin said the country is still at risk as majority demand of bloods is met by professional donors. Only 30 to 35 per cent of the country’s blood demand is met by voluntary donors and patients’ relatives. Currently 200,000 regular voluntary blood donors meet the country’s demand of 800,000 units of bloods, he added. The Chief Coordinator thanked the blood donors for their engagement in the welfare of humanity. QF has so far provided 105,903 units of safe blood since its inception in 2000. A survey shows that regular blood donors remain free from critical diseases and less risky of facing heart attack.